Transformative Opportunities is UCF’s Division of Student Development and Enrollment Services’ strategic plan to support student success. Learn about the steps we are taking to inspire, engage and impact the student experience in the next five years. SDES is dedicated to making the UCF student experience the best it can be. From enrollment through graduation, we offer co-curricular experiences that promote student success. Our strategic plan, Transformative Opportunities, builds on our vision, mission, strengths and aspirations. The plan enhances the goals outlined in our university’s strategic plan. Throughout this plan, we have outlined strategies for improving student retention, progression and success. 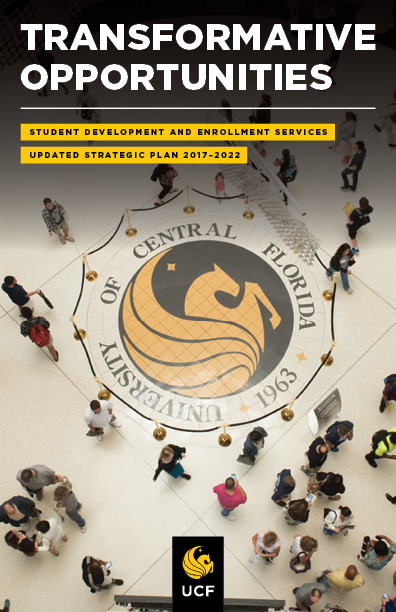 If you have questions about our strategic plan, please contact us at sdescommunications@ucf.edu.